Isis was brought to RAPTOR Inc. after being found on the ground with a gunshot wound to her right wing and her forearm shattered. 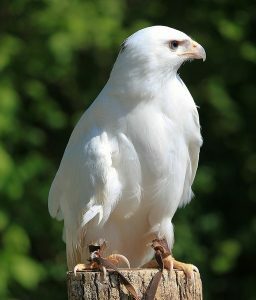 She is a leucistic (partial albino) bird with blue eyes and very light colored beak, cere, and talons. Leucisim is a genetic mutation that prevents pigment from being deposited normally on feathers. Isis is 19” tall, weighs 2.5 lbs. and has a 48” wingspan. Like the other birds at RAPTOR, Isis is fed a regular diet of mice, rats, chicks and quail.